It's 4:37 in the afternoon and I'm sitting at the computer in my pajamas. Not that I've been in them all day. Oh no, I WAS dressed, with my hair done, and make-up on. Then it started raining. So earlier today, when I thought that one of the boys was using the bathroom for an awfully long time, they weren't. And since I thought it was one of the boys for the first few minutes, it allowed the water to get built up even higher and higher inside of the window well... Halfway up the window, to be exact. 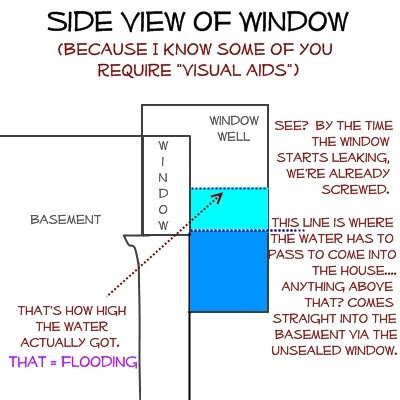 FYI: The water doesn't even begin to leak until it's even with the windowpane. And by then, the window well already has a solid 6 inches of water. So I ran outside, and in my ghetto-ness, I laid our trusty deflated swimming pool over the top of the deck. (Oh yeah, my window is under the deck where you can't reach it. 'tis awesome) and then I ran over to the shed to get the wet vac out because I needed something besides towels to clean up this mess. Meanwhile, Aunt Meredith was inside mopping up as much water as she could while the shortlings asked why we haven't even gone swimming today and why are we using their towels? When the situation was more under control, I called DadGuy up and told him what was happening. He asked if I'd called the property manager yet. You see, our "manager" is actually quite the "idiot." And when I talk to her, I have a really hard time not laughing at her or lashing out in expletives as I try to explain to her just how dumb she is. Not that I could explain it to her, she's. just. that. dumb. So no, I'm not the one that makes phone calls requiring tact. And after a few rounds of phone tag, and a few new piles of laundry, I decided that I wasn't going to be bothered to get dressed in dry clothes again (which would give me yet MORE laundry. really, it is the bane of my existence) and instead decided to sit down here and tell you all about it. Because I have nothing if not priorities. In other news, I'm so glad I'm moving.